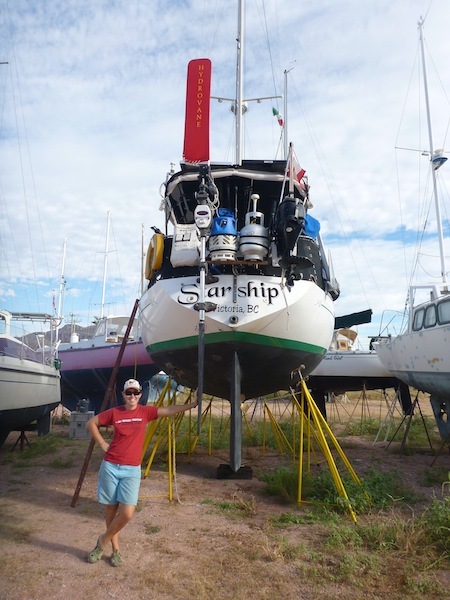 When we arrived in the boat yard Starship was in great shape, just dirty. We worked our butts off for a week putting her back together and installing new equipment. We're most excited about our new Hydrovane wind vane. A wind vane is a self steering device the requires no electrical power. It steers based on a relative wind angle (perfect for steady trade wind sailing like the puddle jump). 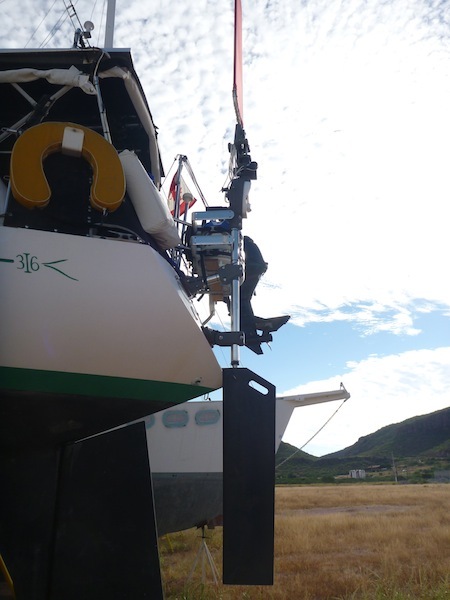 It can also be used as a emergency rudder if something happens to the main rudder. Once Starship was back together, my parents came for a 10 day visit. Since we had cut the timing a little bit too close, my parents arrived to a boat with no food. Ooops. I felt pretty bad about this, but they seemed to be genuinely excited to go grocery shopping with us and get the full cruising experience. "It'll be an adventure" my Mom said. My Mom helped me go down every aisle to find the cheapest and best products. My Dad was a supper grocery packer and carrier. We walked to the grocery store and took a bus back to the marina with all of our goods. It's amazing how much stuff 4 people can carry! I was glad that Twinkle was up to the task too. After a vigorous upwind bash to Algodones we were all excited by the anchorage. There was a beautiful beach, a stunning mountain backdrop, good wind, flat water and a cool beach bar/restaurant. We spent the next 5 days kitesurfing, beach walking, hiking, snorkeling, skurfing and eating great meals. Kitesurfing at Algodones was different from what we are used to, since you could only go a couple hundred meters before having to turn around (compared to miles at some spots). As a result everyone got a lot of practice doing transitions (changing directions). We also went to bed really early each night. Before Chris and I were even out of bed one morning, my parents came zooming back with a fish they had caught. They just wanted to make sure that it was edible and get fish cleaning instructions. 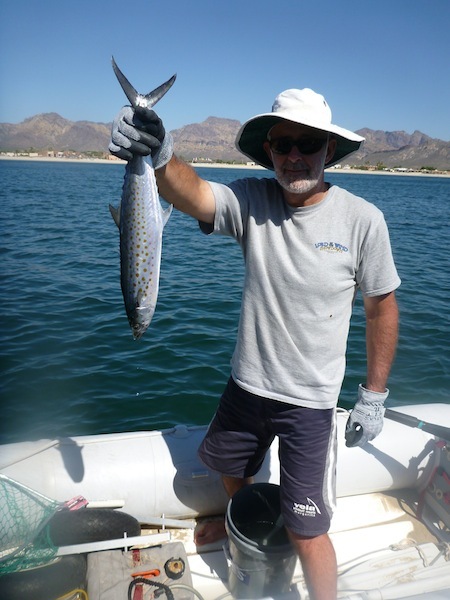 The sierra mackerel made for delicious fish tacos. I feel like the luckiest girl to have parents that are so excited and enthusiastic about our life on board Starship. Dad, I love how interested you are in all things boat related. You have great questions, useful ideas and are such helpful crew. Mom, thanks for always inspiring me in the galley and bringing/making so many treats on board. You make me feel like I'm doing a great job even if I can never get all of the sand out of Starship or keep her as organized as I would like. You guys are the best and I love you! Thanks for this great blog and a wonderful time on starship, ratfinks. We miss your and the Mexican warmth. Miss you guys too! Looking forward to when you visit again! Glad to hear the trip went well! Can't wait to see you guys in December! Looks like the boat is in good shape! Looking forward to following your adventures again!! MSH! Thanks Nick! We're looking forward to the upcoming adventures!